This collection is loaded with 530+ of the tightest, funkiest, most detailed top kick free loops for any genre of house. Produced at 127bpm for ultimate ease plus 70 bonus deep, round kicks to fill out the bottom end. I think the whole SOR series are a grail of good stuff actually useful to find their way in real records. Even if I don´t really use loops, the way the loops are produced in this series makes it easy to chop and cut them up into easy-to-isolate one-shot samples. I chopped up big parts from Minimal Tech Revolution and Kick Free Revolution. Takes time, but its really worth it. No resampled samples from other sampled stuff that took their samples also from other tracks/samples. No overused dynamics or effects and stuff, so you can easily tweak them to your own style. Thats what the most important for me and the biggest failure and mistake of nearly all other sample libraries. The amount of useful one shot samples that I got out of this series is massive. And I absolutely love the experimental section. 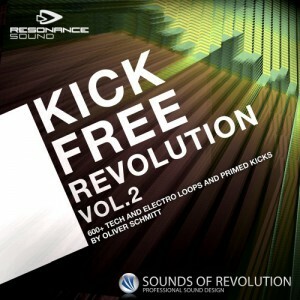 Reviewers favourite Olli Schmitt and his Sound of Revolution label return with volume two of Kick Free Revolution, 600+ loops of tight tops at 127bpm.